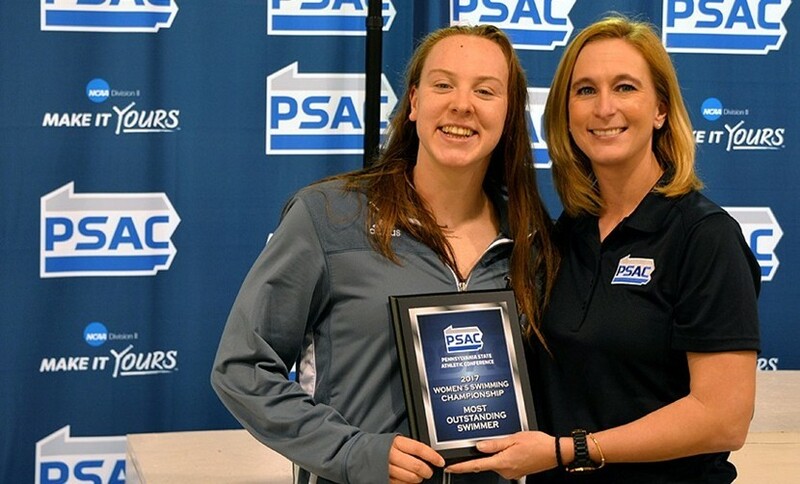 "Basically she swam at the Pennsylvania state conference meet – PSACS for short. Then 30 mins after swimming the mile got in again and swam 200 yard backstroke – pbd by 2 seconds and won that too. And won most outstanding female swimmer of the meet. She now goes to Alabama to swim in the division 2 NCAA which is equivalent of our nationals in 3 weeks. Not bad for her freshman year"
Suffice to say everyone at Armthorpe are over the moon for your accomplishments and look forward to congratulating her in person when she next swims for the club. Below are a number of more detailed write-up from various sources all telling us how brilliant Georgia has been.